As your little ones grow, their sense of independence is always increasing. Whether they are taking their first steps, learning to feed themselves, or making a first attempt at tying their shoes, they are developing important skills that will help them become self-sufficient and able to take care of themselves. The problem for many parents is giving smaller children the space they need to explore and learn while still keeping them safe. Kids want to do it themselves, yet they can be seriously injured if they try to climb a countertop to get a glass of water or brush their teeth, or use the shelves of a bookcase as “stairs” as they reach for their favorite story. Fortunately, there is an easy solution – kids wooden step stools are a safe and simple way to give children a taste of independence while preventing unfortunate accidents. As with anything else you buy for your little ones, there are several things to consider when buying kids wooden step stools. Safety always comes first, so it is important to look for stools that are sturdily built – stools that slip, rock when children stand on them, or do not have large enough steps can cause toddlers to lose their balance and fall. To prevent accidents, look for well-made step stools with a broad base, as well as handles for easy moving. In addition, step stools with storage under the top step should have safety hinges to prevent pinched fingers. Step stools that are made from child-friendly, non-toxic materials are also a must. You can find dozens of adorable stools that are created just for kids from safe and environmentally friendly materials. Many manufacturers feature step stools that double as seating for the bathroom or playroom; you will also find stools with storage for toys and other items underneath the steps. Look for classic wood finish designs, or stimulate their imagination with colorful themed stools in their favorite motifs or licensed characters. You can find a great variety of wooden step stools from trusted manufacturers such as KidKraft, Guidecraft, Levels of Discovery, Teamson Kids and more at A Kid Place online. Visit us today for our fantastic assortment of stools – dozens of styles are available – and so much more! Choose from our terrific selection of children’s furniture and toys, and create the bedroom or playroom of your little ones' dreams. Your child’s playroom or bedroom is a safe haven – a place where they can get away from the busy world and just be themselves. The hours spent in the playroom help your child to build important tools that will last a lifetime, from learning how to get along with others to developing cognitive abilities and creative problem solving skills. You can make their little world into a truly special place with lovingly designed children’s playroom furniture that is made to suit their personalities and your budget. Bookcases and shelves – Store your child’s favorite books, puzzles, games and more with strong and durable bookcases that are just the right size for kids. Chairs and seating – Create a cozy nook for reading, rocking their dolls and plush toys to sleep, or just plain relaxing with pint-size chairs and other seating options. 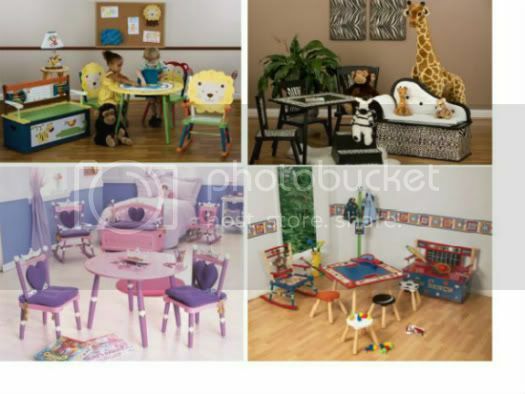 Table and chair sets – For arts and crafts or a special snack, kid-sized table and chair sets are essential for children’s playrooms. Toy boxes and toy chests – Cleanup time is a snap with toy boxes and toy chests that are designed with safety in mind. Vanity and dress-up tables – Your little princess or diva will be thrilled with a vanity or dress up table of her own, with plenty of nooks and crannies to store her treasured pretend play items. Lamps and lighting – Special lamps decorated in their favorite themes are sure to add the perfect finishing touch to your child’s playroom furniture setup. Guidecraft – This noted children’s furnishings company has everything you need to outfit the playroom. All of their kids’ items are made from high-quality, non-toxic materials and are built just for little ones, in classic styles as well as charming themes like butterflies, farm animals, retro racers and more. Kidkraft – Kidkraft has everything you need to outfit any playroom, from dress-up furnishings to toy boxes to play kitchens to bookshelves, just to name a few. Levels of Discovery – You will always find something new from Levels of Discovery, even for the child who has it all. From stepstools to rockers, from unique shelving designs to vanities, you will find one-of-a-kind designs from this top-rated kids’ furniture maker. Teamson Kids – This popular manufacturer offers a great selection of whimsical and truly beautiful hand-painted children’s furnishings. Some of the delightful themes from Teamson Design include a magic garden series, under-the-sea motif, and an exciting jungle safari adventure. You can find a great selection of children’s playroom furniture from these trusted manufacturers at A Kid Place online; and even more brands are coming soon! Come check out our amazing selection of products made just for kids! From children’s furnishings to high chairs and baby safety gates to the highest quality educational toys, you will find everything you need for the playroom and nursery. All items meet or exceed government safety standards and are sourced from award-winning manufacturers who specialize in quality products for children. Guidecraft offers an amazing selection of kids’ bookcases for the home and daycare center. Start their library out right with hand-painted and carved themed shelves, or store the largest volumes with their big book storage box. Single-sided book storage with hanging canvas sleeves allows smaller children to find their favorite stories by the pictures on the cover; for the classroom or waiting room, dual storage book browsers are the perfect solution. Whether you prefer a classic wood finish or brightly-painted, themed furnishings (the princess and firefighter versions are customer favorites), Kidkraft has the bookcases you need for all of your storage needs. Sling bookshelves that hold picture books with the covers facing outward are great for smaller children, while young readers love the stacking puzzle bookshelf. For something different, look for the whimsical rotating book towers from Levels of Discovery. 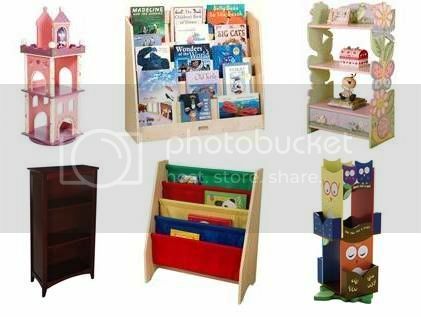 You will find something for every child with these unique book storage shelves – from a princess castle to firefighter fire hydrant theme to adorable owls to friendly monsters. Book towers are perfect for smaller spaces and work well in a day care or preschool setting where multiple children are likely to be browsing at once. Teamson Kids is noted for their beautifully-crafted themed children’s furnishings, and their bookcases are no exception. Choose from the popular Magic Garden design, or set off on a new adventure with the Sunny Safari and Under the Sea book themes; if trains, planes and automobiles spark their enthusiasm, the transportation series is the perfect fit. Don’t forget the matching bookends to keep their treasured books in place! You can find a great selection of bookcases and shelves from these trusted manufacturers at A Kid Place online; even more brands are coming soon! Visit us today for our fantastic selection of children’s items! From kids’ furnishings to baby monitors and high chairs to the highest quality educational toys, you will find everything you need for the playroom and nursery. All items are sourced from award-winning manufacturers who specialize in quality products for children and meet or exceed government safety standards. Feeling overwhelmed by all the new toys, games, puzzles, action figures, and other mysterious objects that seem to be scattered throughout every part of your home? Now that Christmas and Chanukah are over for another year, you are probably wondering what to do with all of the accumulated holiday clutter; wooden toy boxes offer the perfect solution when it comes to clean-up time. Unlike those unsightly plastic bins and air-tight containers, a wooden toy chest can be appealing and attractive, as well as practical – not to mention safer for little ones. If you are considering buying a toy box (or two) to contain all of your kids’ treasures, here are some important points to consider. Every year, it seems that we hear about at least one unfortunate accident where a small child becomes trapped inside a toy box or storage bin. To prevent unnecessary and tragic mishaps, high-quality toy boxes are equipped with side cut-outs to prevent suffocation in the event that your child does climb inside during play. In addition, toy chests with lids should be fitted with safety hinges to prevent the top from slamming closed on little fingers; rounded edges prevent bumps and bruises for the most rough-and-tumble kids. When you choose a toy chest for your child’s room, look for a product that is made using only non-toxic, kid-safe materials, including lead-free paint. You can find adorable wooden toy chests to fit any decorating theme that are child-safe and eco-friendly, as well. When it comes to kids’ furnishings, durability is the key. Wooden toy boxes are perfect for busy kids, as they can stand up to years of tough use; buying a wooden toy chest ensures that your kids, and even grandkids, will be using it to store their favorite games and treasures for years to come. There are plenty of convenient options for toy storage, from traditional wooden chests with lids, to open bins with dividers for easy organization, to bins with clear sides that allow your little ones to locate the toy they want without digging to the bottom of the pile. You can find a great selection of toy boxes and bins from trusted manufacturers such as KidKraft, Guidecraft, Levels of Discovery, Teamson Kids and more at A Kid Place online. Visit us today for our fantastic selection of wooden toy boxes and so much more! From children’s furnishings to the highest quality educational toys, you will find everything you need for the playroom and nursery. All items meet or exceed government safety standards and are sourced from award-winning manufacturers who specialize in quality products for children.